Whether you have an important business tradeshow to attend or need something new and exciting for a fundraiser or annual meeting, our 36 inch, Custom White Prize Wheel with Extension Base is the perfect solution. Brilliant white laminate covers the entire front surface of each wheel. The wheel has 20 sections that are ready for customization. Our wheels are made from the highest quality, cabinet-grade MDF wood. Each wheel is hand balanced to ensure a random spin. The wheel spins on maintenance-free, aircraft-quality bearings and features durable black-edge molding, heavy-duty ¼ inch pins with plastic end caps, insert lock nuts and a professional red urethane clapper with white Delrin tip. Our prizes wheels come bundled with a convenient storage bag so you can take it with you to trade shows, fundraisers, and events without a struggle. 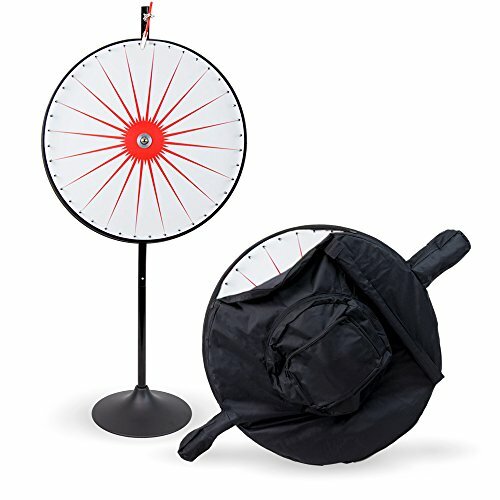 Then pack your wheel up and carry it over your shoulder to your next event! Each wheel measures 36 inches in diameter and comes with a powder-coated, black metal base and steel extension pole. The base height is 17 1/2 inches, but when the pole is fully extended, the stand measures approximately 66 inches tall. View More In Casino Prize Wheels. If you have any questions about this product by MIDWAY MONSTERS, contact us by completing and submitting the form below. If you are looking for a specif part number, please include it with your message.